Drop ‘N’ Toss is proudly Canadian. Our locally made bins and equipment are all exceptionally made. Through all of our partnerships and services, Drop ‘N’ Toss prides itself on credible service and quality rentals. Fast, honest and convenient service is our staple. In the first year we have already become a go to for many contracting companies, renovators, consultants, and other commercial and residential clients. We guarantee no hidden costs and drop-offs and pick-ups within 24 hours. Drop ‘N’ Toss aims to reface the industry with a more honest and professional approach to waste management and environmental services. The company was founded by professionals who have spent over 40 years in the waste management and environmental industry, some of which grew up in it. As experts in the industry, we want to properly foster and take care of current and future clients in an honest and professional manor. Our team is loyal, trained and professional holding integrity to the highest importance. All our vehicles and equipment are the highest quality and well maintained, reflecting our diligent and respectable reputation along with our team. 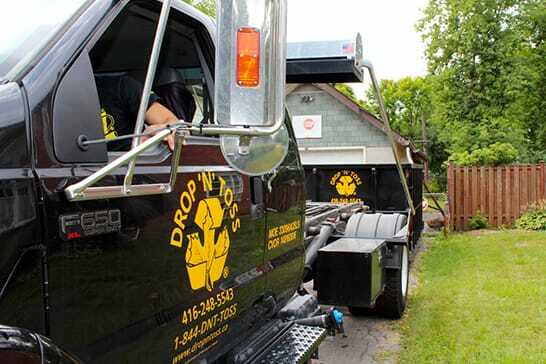 Drop ‘N’ Toss aims to serve you and maintain a long-term relationship with all clients both commercial and residential. Please let us drop it before you toss it. If you want we will drop and toss it.